As we head into Fall and cooler temps (hopefully! ), most of us are experiencing that end of summer problem… dull and damaged hair from too much time in the pool or the ocean, exposure to sun, hats and more! So it’s the perfect time to share my favorite tips on fixing that, just in time for new styles and new fashions. Honestly, my hair was a mess. Dry, dull and frizzy. 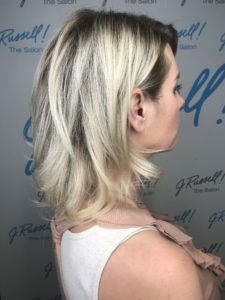 Knowing that I couldn’t be the only person going through this, I decided to seek professional help from one of our stylists who would not only fix this, ASAP, but also would teach me how to avoid this next summer! 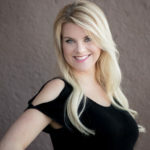 So please meet my friend, Heidy, who is a fantastic stylist and also our retail manager for Goldwell Hair Care products at J. Russell the Salon. Step one included a discussion about my hair, and my concerns, and then we went to work. Next up, a soothing visit to the wash area, where Heidy gently cleaned and conditioned my hair with Goldwell Blonde & Highlights shampoo and conditioner. She explained that Goldwell is a specific line of products specially created to work with color treated hair. The company started with a line of hair colors, so their hair care products are designed specifically to address hair like mine. She recommends it for all of her clients because it’s nourishing to the hair, doesn’t weigh hair down and is user friendly. 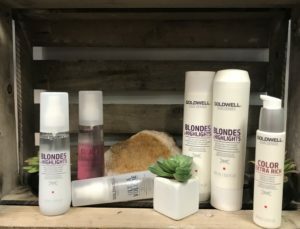 For summer damaged hair, the Goldwell Blonde shampoo & conditioner helps prevent brassy tones, which is important in the Palm Springs area, as our water tends to be hard and mineral rich, which can make your color fade faster and get brassy. The smooth feel of my wet hair was such an immediate improvement, I couldn’t wait to see how it looked when we were finished! After an incredible neck massage, we headed to Heidy’s station. While she combed my hair, she used Goldwell Blonde & Highlights Serum Spray and I could tell right away that this was a bottle full of magic! Immediately my hair became smoother and easier to comb out. As Heidy worked through a fantastic blow-dry, I could really see the dramatic results. My hair was so shiny, bouncy and easy to manage. When Heidy was finished, my hair looked 100-times more moisturized and smooth. The best part? My blowout has lasted for days and when I finally washed my hair again, it still felt better than it had before Heidy had worked her magic. 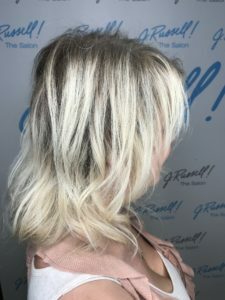 The results speak for themselves, Goldwell has incredibly effective and concentrated products that are formulated for color clients, and Heidy gives one amazing blowdry! 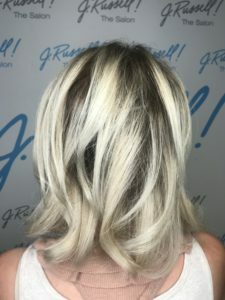 Experience all the benefits of Goldwell and how they can help save your hair at J. Russell the Salon in Palm Desert.